"Jeannie Cho Lee" has rated the wine "Planeta La Segreta Sicilia Rosso, Sicily, Italy" from the vintage 2008 on 01.05.2010 with 85 of 100 points.
" Attractive nose followed by wonderfully balanced, supple flavours of cherries and plums. This wine has a restrained style with nice balanced flavours without any excess ripeness. Drink young. Tasted in: Hong Kong, China. Maturity: Drink. " "Wine Spectator" has rated the wine "Planeta La Segreta Sicilia Rosso, Sicily, Italy" from the vintage 2014 on 30.04.2016 with 86 of 100 points. "Wine Spectator" has rated the wine "Planeta La Segreta Sicilia Rosso, Sicily, Italy" from the vintage 2013 on 28.02.2015 with 86 of 100 points. "Wine Enthusiast" has rated the wine "Planeta La Segreta Sicilia Rosso, Sicily, Italy" from the vintage 2011 on 03.01.2013 with 87 of 100 points. "Wine Enthusiast" has rated the wine "Planeta La Segreta Sicilia Rosso, Sicily, Italy" from the vintage 2009 on 04.01.2012 with 87 of 100 points. 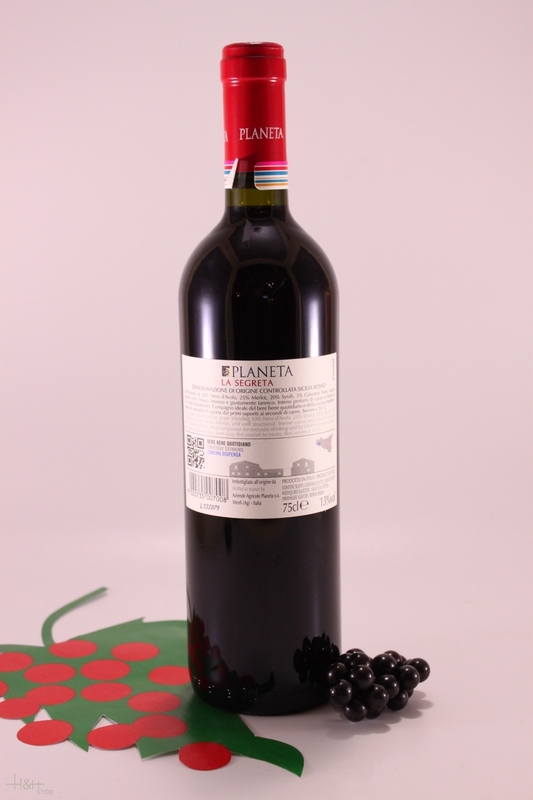 "Wine Enthusiast" has rated the wine "Planeta La Segreta Sicilia Rosso, Sicily, Italy" from the vintage 2010 on 04.01.2012 with 87 of 100 points. "Wine Spectator" has rated the wine "Planeta La Segreta Sicilia Rosso, Sicily, Italy" from the vintage 2009 on 31.03.2011 with 87 of 100 points. "Wine Spectator" has rated the wine "Planeta La Segreta Sicilia Rosso, Sicily, Italy" from the vintage 2008 on 31.10.2009 with 86 of 100 points. "Vinous Antonio Galloni" has rated the wine "Planeta La Segreta Sicilia Rosso, Sicily, Italy" from the vintage 2008 on 01.08.2009 with 87 of 100 points. "Wine Enthusiast" has rated the wine "Planeta La Segreta Sicilia Rosso, Sicily, Italy" from the vintage 2007 on 02.01.2009 with 87 of 100 points. "Wine Spectator" has rated the wine "Planeta La Segreta Sicilia Rosso, Sicily, Italy" from the vintage 2007 on 15.10.2008 with 86 of 100 points. "Wine & Spirits Magazine" has rated the wine "Planeta La Segreta Sicilia Rosso, Sicily, Italy" from the vintage 2006 on 01.06.2008 with 84 of 100 points. "Wine Enthusiast" has rated the wine "Planeta La Segreta Sicilia Rosso, Sicily, Italy" from the vintage 2006 on 03.01.2008 with 88 of 100 points. "Wine Spectator" has rated the wine "Planeta La Segreta Sicilia Rosso, Sicily, Italy" from the vintage 2006 on 15.12.2007 with 88 of 100 points. "Wine Spectator" has rated the wine "Planeta La Segreta Sicilia Rosso, Sicily, Italy" from the vintage 2005 on 30.04.2007 with 87 of 100 points. "Wine Spectator" has rated the wine "Planeta La Segreta Sicilia Rosso, Sicily, Italy" from the vintage 2004 on 30.04.2006 with 86 of 100 points. "Wine Enthusiast" has rated the wine "Planeta La Segreta Sicilia Rosso, Sicily, Italy" from the vintage 2005 on 07.01.2006 with 88 of 100 points. "Wine Enthusiast" has rated the wine "Planeta La Segreta Sicilia Rosso, Sicily, Italy" from the vintage 2003 on 07.01.2005 with 87 of 100 points. "Wine Spectator" has rated the wine "Planeta La Segreta Sicilia Rosso, Sicily, Italy" from the vintage 2003 on 31.12.2004 with 87 of 100 points. "Wine Spectator" has rated the wine "Planeta La Segreta Sicilia Rosso, Sicily, Italy" from the vintage 2002 on 31.03.2004 with 87 of 100 points. "Wine Spectator" has rated the wine "Planeta La Segreta Sicilia Rosso, Sicily, Italy" from the vintage 2001 on 30.04.2003 with 87 of 100 points. "Wine Enthusiast" has rated the wine "Planeta La Segreta Sicilia Rosso, Sicily, Italy" from the vintage 2002 on 10.01.2003 with 88 of 100 points. "Wine & Spirits Magazine" has rated the wine "Planeta La Segreta Sicilia Rosso, Sicily, Italy" from the vintage 2000 on 01.08.2002 with 86 of 100 points.